Soon after Billy Griffiths joins his first archaeological dig as camp manager and cook, he is hooked. Equipped with a historian’s inquiring mind, he embarks on a journey through time, seeking to understand the extraordinary deep history of the Australian continent. Deep Time Dreaming is the passionate product of that journey. It investigates a twin revolution: the reassertion of Aboriginal identity in the second half of the twentieth century, and the uncovering of the traces of ancient Australia. It explores what it means to live in a place of great antiquity, with its complex questions of ownership and belonging. It is about a slow shift in national consciousness: the deep time dreaming that has changed the way many of us relate to this continent and its enduring, dynamic human history. 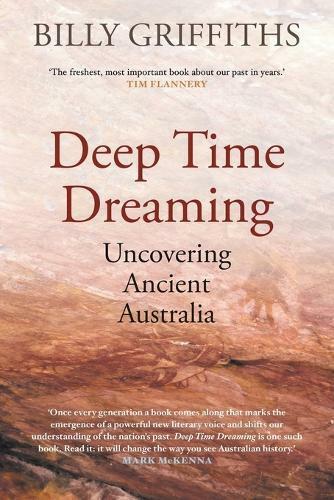 In Deep Time Dreaming, Billy Griffiths brings us the story of the development of modern Australian archeology, in all its adventure and excitement and contradiction. He comes at the story of Australian archeology as an historian, as well as an enthusiast who has worked on many projects. As he says, he is neither an archaeologist nor an Indigenous man. What he seeks to synthesise is the relationship between the development of Australian archaeology and the emergence of the Western historical concept of ‘deep time’; and the gradual political and social understanding, or at least acknowledgment, of the relationship of Indigenous Australians to land, culture, and time – to the Dreaming. A survey in the late 1990s of Australian archaeologists listed one of the most common questions they were asked as: ‘Are there things old enough to be archaeological here?’ Australia’s human history is over 60,000 years old. The process by which non-Indigenous people have sought to comprehend this time-frame of human existence, and the process by which Indigenous people’s knowledge has been able to affect political change are the twin strands of this work. Deep Time Dreaming is a wonderful achievement, both scholarly and conversational. It addresses the scope of human inquiry, the desire to know our past, and the ways in which we have refused to know it. It is both political and humane.